Polish firm Deep Ocean Technology has unveiled the latest of Dubai's outlandish architectural endeavors — the Water Discus Hotel — which is to be comprised of a series of sci-fi styled discs, one of which will be positioned 21 stories underwater. Offering guests a view directly into the Persian Gulf from the beds of their modest two-person rooms, the hotel is to be constructed by shipyard firm Drydocks World. In addition to the unusual accommodation, the proposed hotel is to include a diving center, underwater tourist vehicles, a spa, garden areas, an above-water terrace, and a helipad for guests. 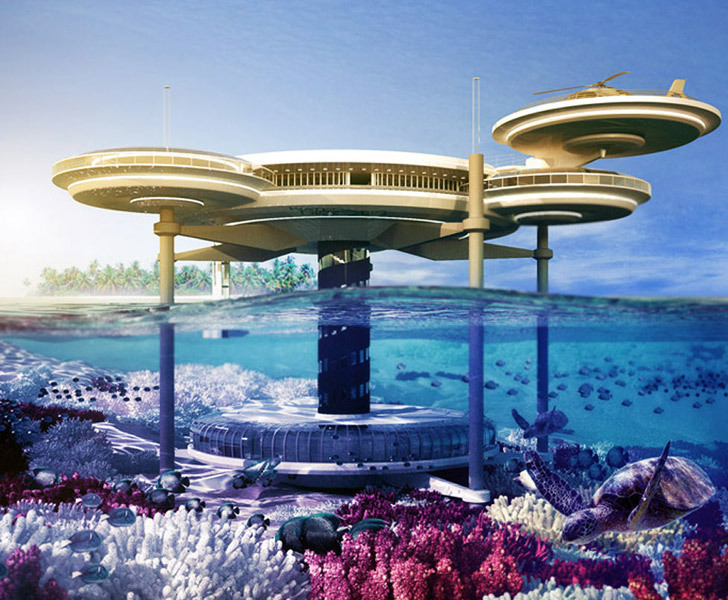 Dubai had announced plans to construct a different underwater hotel, Hydropolis, in 2006. Projected to cost 300 million pounds to construct, it would have stood as one of the world’s most expensive hotels, home to an array of facilities including a cosmetic surgery clinic and a marine biological research laboratory. After a series of delays, the hotel remains unbuilt. In the intervening years however, Dubai has embarked upon a staggering array of peculiar structures, including the soon to be surpassed world’s tallest tower their now infamous island atlas, which last time we checked, is still sinking. Where does the dirty toilet and bath water go? 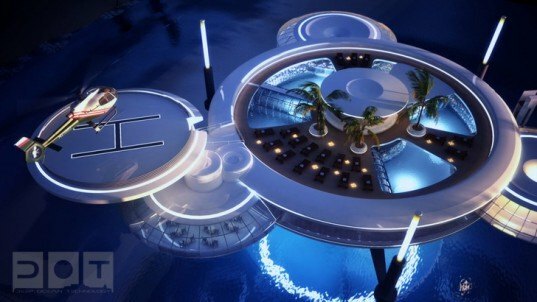 Dubai had announced plans to construct a different underwater hotel, Hydropolis, in 2006. Projected to cost 300 million pounds to construct, it would have stood as one of the world's most expensive hotels, home to an array of facilities including a cosmetic surgery clinic and a marine biological research laboratory. After a series of delays, the hotel remains unbuilt. In the intervening years however, Dubai has embarked upon a staggering array of peculiar structures, including the soon to be surpassed world's tallest tower their now infamous island atlas, which last time we checked, is still sinking. This latest—intentionally—submerged project, looks to have the backing to become a reality. And, if not constructed in the planned location, Deep Ocean Technology have made design plans adaptable to varying sea levels. Formed of a 'stacked' structure of discs, DOT explains that "Each design will be tailor-made to suit its future users and local conditions, such as the shape of the coastal line and depth of water around the coral reef." And if that particular area of Dubai were to fall out of fashion for any reason, well, DOT has thought of that: "If any changes in environmental or economic conditions occur, the Water Discus modules can be transferred to a different place. This offers a unique opportunity to live underwater on a permanent basis with unlimited options to change locations." The discs which form the hotel are themselves surprisingly versatile. Mounted atop three legs and a vertical shaft containing an elevator and stairway, the discs themselves are interchangeable. From an interior design standpoint, this allows for renovations to be conducted offsite, with minimal disruption to business. Equipped with monitoring and warning systems for safety, the above water discs have "positive buoyancy, which means they can be used as lifesaving vessels after being detached from the main body of the upper disc."